Thank you so mix to this anonymous contributor for writing such a heartfelt piece. Our ephemera are things we can can touch and hold and time travel with. The box that saved me is gone, and it took my soul with it. Its loss the reason I never let go of anything that contains a memory. The items within, each one a tessera in the mosaic that was me. 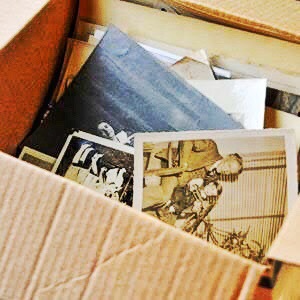 Love letters, photos, trinkets from the departed. The ticket stub from my first rock concert. Jim Moginie’s guitar pick from ’85. All 4 aces from the deck of cards Spandau Ballet threw into the audience at the end of their ’86 Concert. My first Valentine Card. The Secret Diary no one ever knew about. They gave me hope and joy and peace… but they are gone. Every one of them was a piece of my heart, my soul, my life and each did their part to save me. To quell the pain. To sooth the Black Dog. To make me the person I am. But they were thrown out with the garbage. Consigned to the tip with the refuse… trashed. The moment I found out lives with me every day, seared into my brain and echoing across the void that has remained for the last 30 years. 30 years of pain… 30 years without a childhood… without the memories… without a soul. It’s no wonder I’ve been so lost for so long. I don’t remember who I was, who I hoped to be or even who I am. But there is one thing that remains. One thing that couldn’t be contained in a box, that couldn’t be thrown away or cast into the shadows of the past. Without it, I’d have succumbed… capitulated…. departed the mortal coil. For the echo of my soul is contained within the harmonies of the Songs that Saved My Life and when I hear them, I am inside that box, cherishing all it contains… remembering, and for a fleeting moment… no longer lost.